When I opened the box for the first time, the box inside the box was just beautiful. I can not believe the quality of the box! I know that sounds absolutely insane, because I'm raving about a box..but if you know me, you know I love my storage containers/pretty boxes/ baskets, things of that nature!! I figured I'd spare you a picture of the outside of the box..Its a very pretty pink, but when you open it, this is what it looks like! How beautiful! 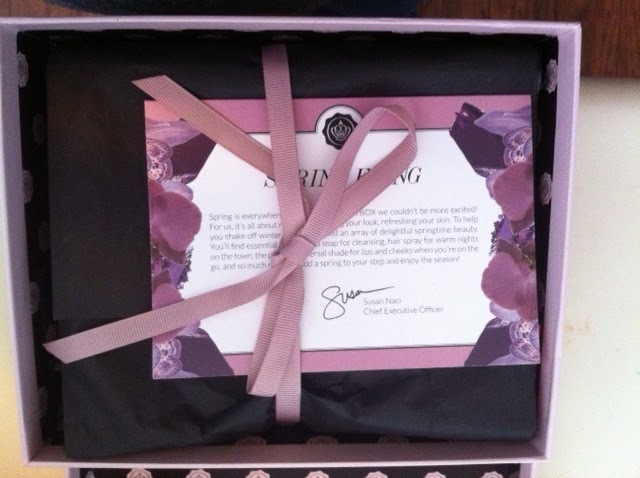 Inside it has the nice black crimp paper (like most other subscription boxes), that I'm sure if Molly got her hands on she'd be in her glory! It comes with a nice little letter that folds out into the information card, which by the way IS extremely informative! It also comes with a nice little Glossy Mag! I was surprised that the items were actually full size or close to full size items! I received 5 items, and a a nice 40.00 gift certificate to Prestiche (towards ANY natural, handmade, bath and body product.) I read it over and it doesn't look like it's off a certain amount either! I haven't looked at the website yet, so I couldn't tell you what the prices actually are! The first item is from Sebasian Professional. 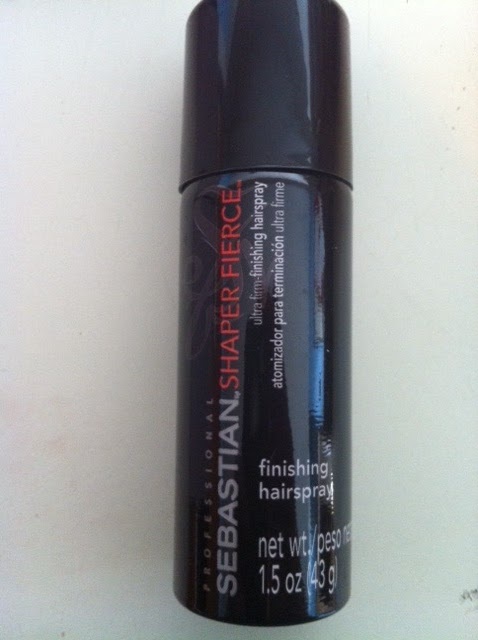 It is a hair shaping spray. I'll have to try this out! I do use hairspray once in a while!! 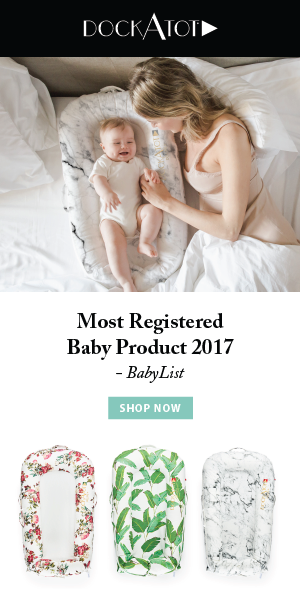 This product I am super excited about! It is from ModelCO, and it is cheek and lip tint. It claims it will give you just the right color for the rosy flush look! I really cant wait to try this, especially on my pale days! I also received a lid last Shadow pen from Pixi, and liquid eyeliner from Elite Models. I tried taking a picture but those babies kept rolling away on me!! This is so exciting!! 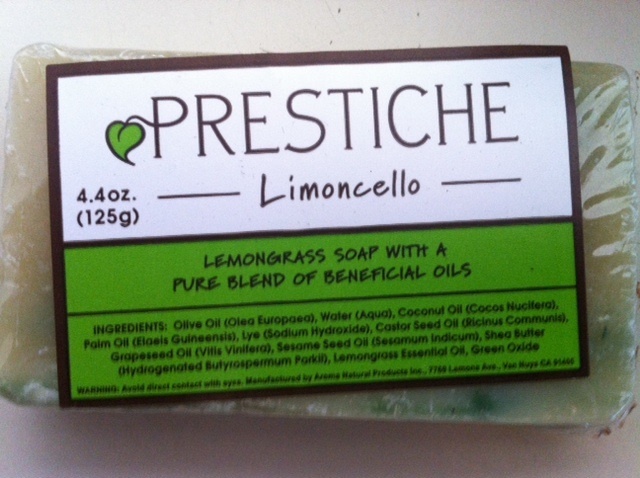 It is made by Prestiche, and it is an essential oils bar soap! It smells SO good, I can not wait to try this! I really like that its made from all natural ingredients. I won't lie and say that's all I use..because believe me I use stuff that probably has tons of chemicals in it. I have to say I have REALLY been trying to buy stuff without the chemicals. My mom is a fanatic about this, shes always on my behind! 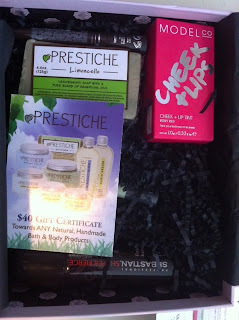 All in all, I would say this box was fabulous. I really loved every single thing that was inside of it, and SCORE I got TWO!